Diamonds are graded for colour according to the letters of the alphabet. Due to the way international diamond grading has evolved over time, we do not begin grading for colour at A. Instead we begin at D and carry through to Z. White diamonds are diamonds that fall within the D – F colour range. If you look at the chart below, you can see the top row refers to the clarity grade and the bottom row refers to the colour grade. The clarity grade begins at Internally Flawless through to Included at the third level. The colour grade begins at D and ends at Z, with a separate grading system for yellow diamonds. For white diamonds, D is the highest grade possible. In other words, a diamond that is graded D colour is colourless. As you progress from D through the alphabet, the level of colour tint in the diamond increases. Depending on the cut type, a hint of colour may begin to be seen when the diamond is viewed from the top at F, even though F is still considered to be a white diamond. This is because some cut shapes enhance the appearance of tint more than others. It is for this reason that most yellow diamonds are cut into Cushion Cut or Radiant Cut shapes. One person’s perception of tint differs from another. The difference between one grade to another is quite subtle. In this sense, the grading of diamonds for colour is an inexact science. The most accurate assessment of a diamond’s colour is done when the stone is loose and is compared to a set of “Master Stones”. The stone is graded from the back by looking through the side of the stone. This is done in order to minimise the effect of the cut in the overall look of the diamond. The National Council of Jewellery Valuers deems that a variance of up to three grades in an assessment of a diamond that is set in a ring mount is an acceptable degree of variation for its valuers. This is because the ring mount can significantly affect the appearance of colour within a diamond, depending on the design, finish and the metal type of the ring mount. The ring design can appear to increase the level of tint within a diamond. A design that creates a shadow between the mount and the setting will affect the look of the diamond. It will make the diamond appear to be darker than it’s true colour. Even white diamonds can appear to be quite tinted. The finish of the setting can adversely affect the look of the diamond. If the inside of the setting is not properly polished, white diamonds can appear to be tinted. This is a common problem with rings that are made in one piece using Computer Assisted Design (CAD). Rings that are crafted using traditional jewellery-making methods do not have the same detrimental effect on the look of the diamond that CAD made rings can do. Our jewellers at Ellissi use traditional jewellery making methods. This is so that each segment of the ring can be fully polished before the parts are assembled. The metal colour will also affect the look of the diamond. A yellow gold setting will reflect through the diamond, giving it a more yellow appearance. As diamonds are a prism, they do reflect the colour of everything that is next to them. If you hold the diamond up to your face, it will reflect your skin colour. If you are wearing yellow while looking at a diamond, the yellow tint of your clothing will reflect through the diamond. Who is Grading the Diamond’s Colour? 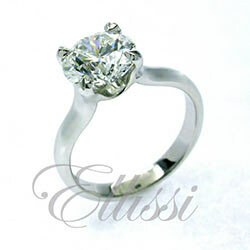 All the diamonds Ellissi supplies are independently assessed and graded by the Gemological Institute of America (GIA). The stone is graded whilst loose, and it is compared by two different graders against a master set of stones, so the most accurate assessment can be made. Once we have set the diamond into the ring design of your choice, the diamond is again independently assessed by a member of the National Council of Jewellery Valuers. It is important when looking at diamonds to consider who is telling you what the colour is, and on what basis this assessment has been made. It must be remembered when considering purchasing a diamond that the colour grade is one of a number of considerations. For any given budget, the higher in the grades you go, the smaller the diamond will be. On the other hand, it isn’t a good idea to compromise on the grades too much just to get a big diamond. A poor quality diamond won’t look great, no matter how big it is. Whilst the 4 C’s are important, there are other quality factors that really affect the look of the diamond that don’t form part of the 4C’s. Great lustre, for example, is really, really important to how the diamond looks. Good diamond selection is all about achieving a balance in the quality elements. For more information on good diamond selection, click here. For information on what you really should avoid in diamond selection, this is a must read.